I was sort of in a polish funk last night and wasn't happy with any of the things I was coming up with for today's theme. I started with a sponged green look with a pattern on top that I hoped would come out looking quilted. It instead turned out look like jade with a weird grid on top of it. Then I did an orange and pink tape mani that I hated. Then as a last attempt I tried doing some dotting in a pattern on top of a Zoya matte. I was thrilled to see it turn out successfully and I love the look that I got. For this look I used Zoya Dovima as the base. 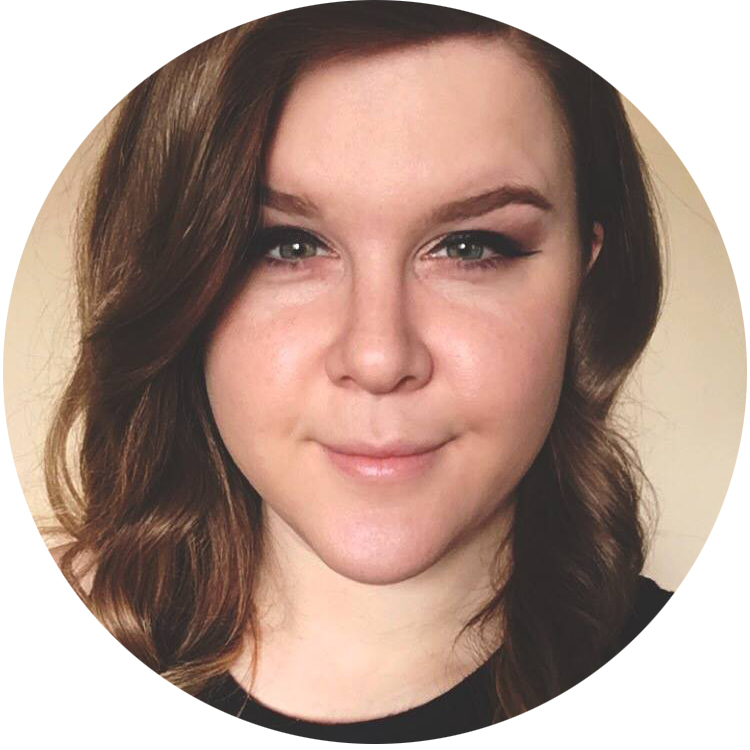 It is a charcoal grey matte and it applies very nicely. I read on All Lacquered Up that you should not use a base coat with a matte polish, so I skipped it this time. Then I alternated dots in China Glaze Sky High Top, OPI Do You Lilac It?, and China Glaze Re-Fresh Mint. I used the small end of a dotting tool to accomplish this. I was very nervous about letting this dry because I wasn't using a quick dry topcoat on top (it would ruin the matte effect, obviously). But I just went to bed and tried to fall asleep with my hands flat and it turned out just fine! 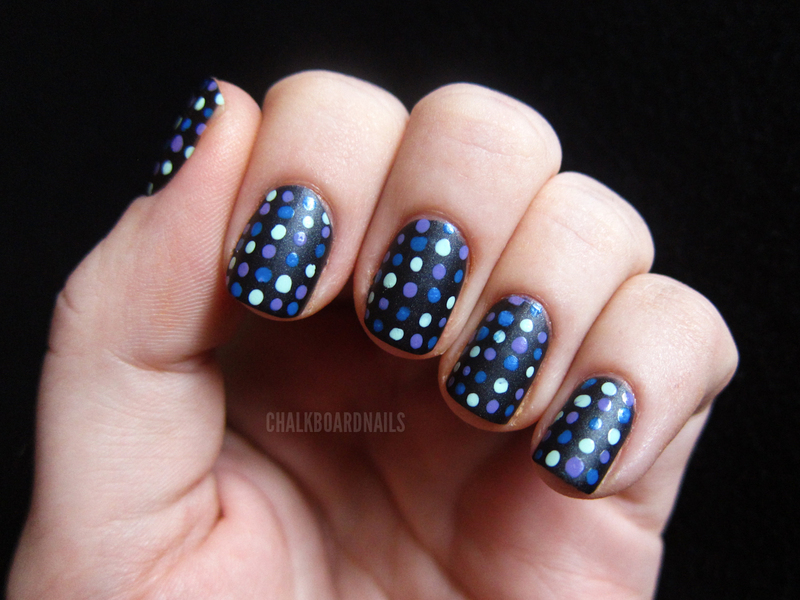 I like this look because it feels very modern with the two polish finishes and yet very retro with the dots and the dot colors I chose. I was glad that I kept trying until I ended up with a mani that I absolutely *loved* instead of just settling for one that I was okay with. You are always amazing in your art! I love the dots!! This just convinced me to go find some matte polish! So rad. Those are both amazing. I love the matte on the first! 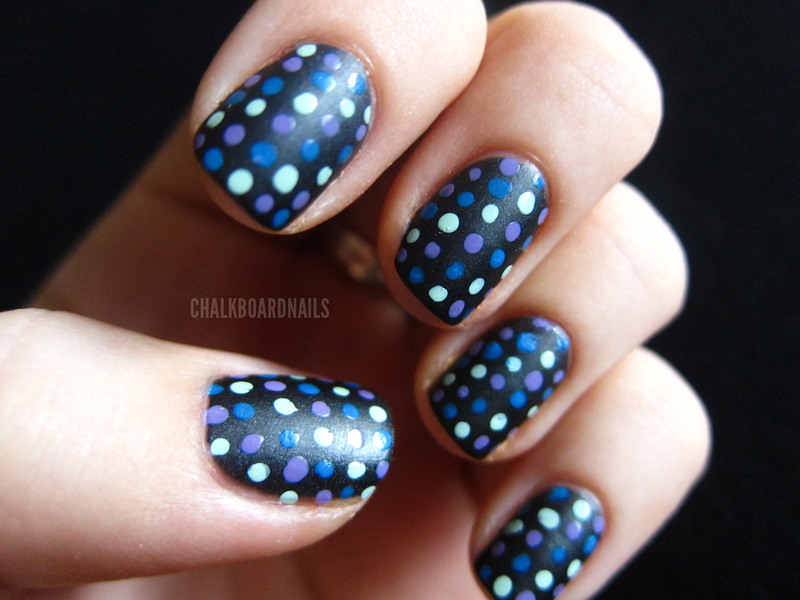 I love the dots and how you used the different colors together. Really great!